Eagles have not ceased to amaze humanity from generation to generation, leaving behind awesome stunt of royal peculiarity. There are over sixty species of eagles in various continents of the world and each has some degrees of excellence as traits demonstrated with gracious acumen. You are an eagle with great prowess and excellent attributes capable of reaching far into the future by riding on the warm air current without a struggle. 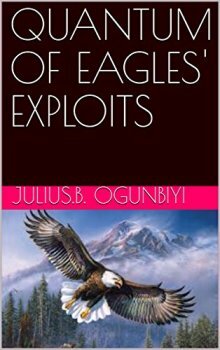 The skills, grace, and wisdom in this book will expose to you the unique selling points of an eagle as distinguishing factors. Eagles are specially built to generate result without struggle or stress in their daily activities. Find yourself from the crowd! Everybody cannot believe in you and you can’t believe in everybody. Always remember, to compete, be complete. Eagles use what they have to survive. You’ve got talent, skills, wisdom, and understanding, use them! The physical transformation of an eagle from nestling to a juvenile is very surprising, though gradual: it is such a marvelous metamorphosis that beats the awe and imagination of man.